Where Western tradition meets modern luxuries Jackson Hole the *Crown Jewel* of the Northern Rocky Mountains is the gateway to Yellowstone and Grand Teton National Parks. 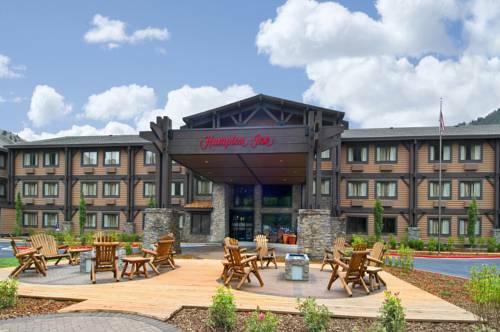 The new Hampton Inn Jackson Hole hotel is located just minutes from the Jackson Hole Airport and the famous Jackson Town Square where you will find shopping dining and entertainment with a taste of the Old West. Jackson Hole is known best for its stunning scenery clear streams world-class skiing and abundant wildlife. Explore some of the most spectacular landscapes rich with majestic mountains and pristine lakes. Jackson Hole has adventures for all seasons. From fly-fishing at Snake River to snow skiing in the Grand Tetons Jackson Hole offers some of the best experiences in the world. Plan your next vacation and learn why people call Jackson Hole WY their favorite place. All reservations must be guaranteed with a major credit card or advance cash deposit to hotel regardless of time of arrival. All reservations must be cancelled by 4pm host time unless deposit is required. Policy is subject to change. Cancellations must be recieved 72 hours prior to day of arrival. The Rendezvous Bistro is a Jackson Hole favorite for outstanding food and wine in a sophisticated yet comfortable atmosphere.